The Curzon Cinema in Clevedon, Somerset is now a community run cinema and boasts the ex Regent Cinema, Poole Christie theatre pipe organ. However, prior to the installation of the Christie, the cinema were keen to have organ music to add to the experience and as such a 3 manual 'melotone-de-luxe' owned by a gentleman in South Wales was hired out to the cinema and played regularly before the films and was also featured in concert and accompanying silent films by a team of up to 5 volunteer organists. The organ was an extremely rare model and there are now only 2 surviving - one of these being in Canada and the other in Holland. 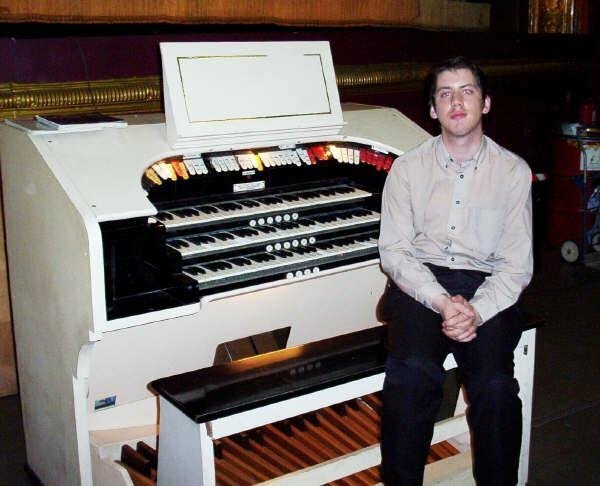 After the installation of the Christie organ at the cinema in April 2012, the organ was sold to a private owner and I am saddened to hear of plans to remove all the original Compton tone generation system and replace this with digital electronics. In essence, it will no longer be a 'Compton'. It's such a pity that the decision hasnt been taken to restore this rare model to original condition. What a great thing it would be to have this rare model here in the United Kingdom perhaps in a music museum of some description as a working exhibit for future generations to see how electronic organs worked before the digital age. Thankfully some footage of this instrument can be found on youtube so I have added the videos below and also a picture of me taken back in 2002 - before my hair started turning grey!